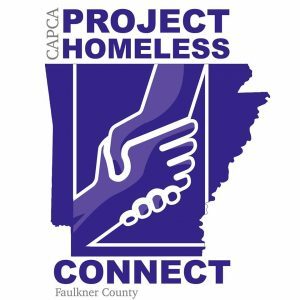 The Community Action Program for Central Arkansas (CAPCA) will be hosting the “Project Homeless Connect” outreach event on Tuesday, January 23, from 4:00 to 7:00 p.m. at St. Joseph Catholic Church Parish Hall, 1115 College Avenue, in Conway. Project Homeless Connect is a community-wide effort spearheaded by CAPCA to make available to those facing homelessness in the Faulkner County area a wide array of health, wellness, and vocational services; as well as care packages containing personal care items and basic essentials; and a hot meal— all free of charge. Among the services being offered are flu shots; health screenings; vision and dental screenings; chiropractic screenings and diabetic counseling; application assistance (for SNAP, TEA/TANF, housing and child support); GED and training program referrals; legal aid services and employment assistance; haircuts and hair braiding; veterans’ assistance; pet care services; as well as eyeglass repair and adjustments. Care packages to be distributed will include bottled water, a first aid kit, body wash & soap, shampoo/conditioner, a razor and shaving cream, towel, washcloth, deodorant, hand sanitizer, a dental hygiene kit, and a brush/comb, among many other items, including gift cards. 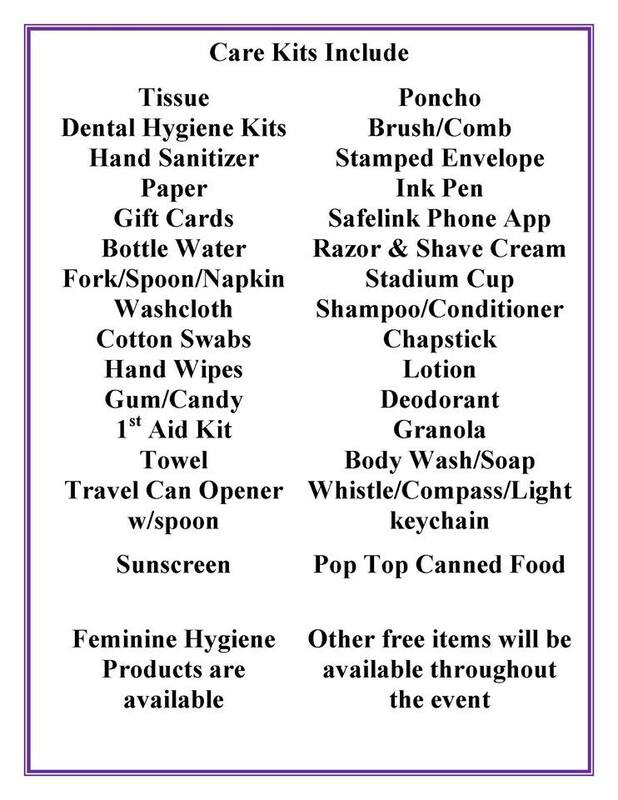 Feminine hygiene products will also be available. 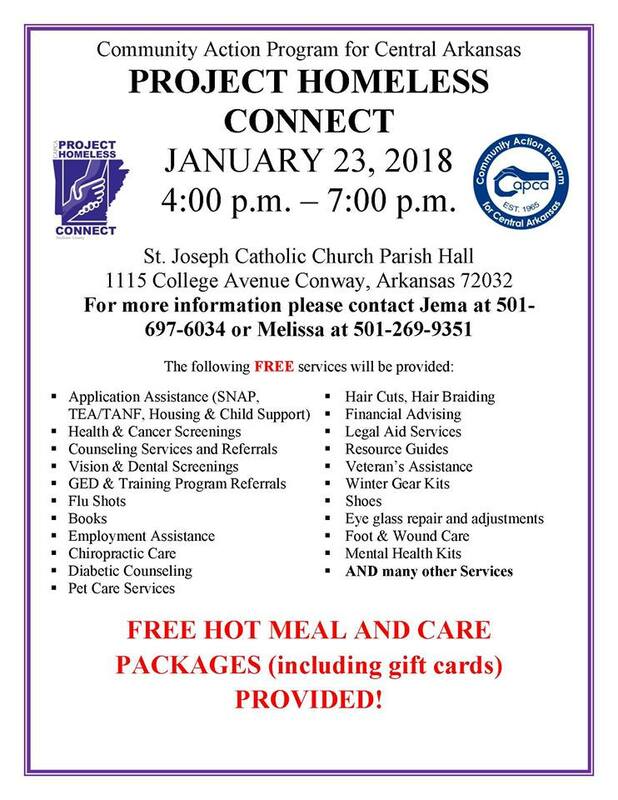 Those interested in learning more about Project Homeless Connect, or who would be interested in volunteering their time at the January 23 event, are encouraged to contact CAPCA’s Melissa Allen (501-269-9351) or Jema Quintana (501-697-6034). More information can also be found at the Project Homeless Connect Facebook page at Facebook.com/projecthomelessconnect.arkansas. 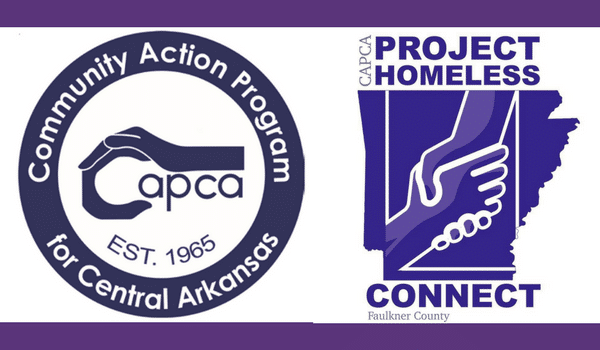 In partnership with our community, the Community Action Program for Central Arkansas (CAPCA) is committed to educating eligible participants by providing quality services which empower lives, expand self-reliance and increase community involvement.